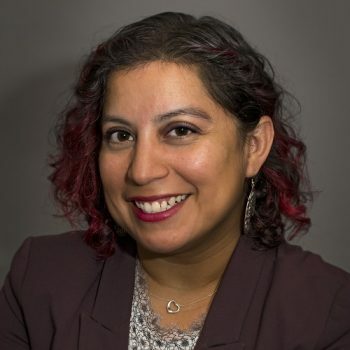 Veronica I. Arreola is the program director for the University of Illinois at Chicago (UIC) Latin@s Gaining Access to Networks for Advancement in Science program. Funded through a US Department of Education Hispanic Serving Institution STEM grant, L@s GANAS works to increase the number of Latinx-identified science students who excel at and graduate from UIC. L@s GANAS offers a number of initiatives including transition coaching, peer mentoring and a research fellowship. In her previous role as director of the UIC Women in Science and Engineering (WISE) program, WISE was recognized with a Presidential Award for Excellence in Science, Mathematics and Engineering Mentoring. Arreola’s honors include being named Woman of the Year by the UIC Chancellor’s Committee on the Status of Women and a Chicago Foundation for Women’s Impact Award. A die-hard Chicago Cubs fan, Arreola lives on the north side of Chicago with her husband, daughter, and their two rescue dogs. She holds a bachelor’s degree in Biological Sciences and a masters in Public Administration, both with concentrations in Gender and Women’s Studies.